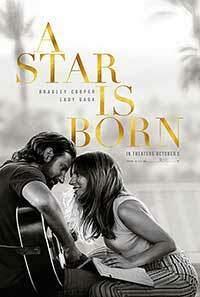 Move over Janet Gaynor and Frederic March, Judy Garland and James Mason, Barbra Streisand and Kris Kristofferson, here come Bradley Cooper and Lady Gaga in the third remake of this Hollywood romantic staple, A Star Is Born. This production had a lengthy gestational period, starting seven years ago as a Clint Eastwood project that stalled over the selection of its leads that were not finalized until last year. Similar to the two previous film versions of A Star is Born, the story centers around the romance between Jack and musical newcomer, Ally (Lady Gaga) whom he discovers singing an Edith Piaf number “La Vie en Rose,” at a local gay/transvestite bar. Ally is a shy young woman who writes her own songs but lacks the self-confidence to perform them in public. Once Jack hears Ally’s voice, he is completely smitten and determines to make her a star, beginning with her sudden appearance onstage during one of his gigs. Jack and Ally begin to tour together and predictably take their relationship to the next level, culminating in a wedding ceremony, hastily arranged by Noodles and his friends. Everything changes abruptly when snarky music producer Rez Gavron (Rafi Gavron) catches a Maine concert and envisions Ally as a major pop star. 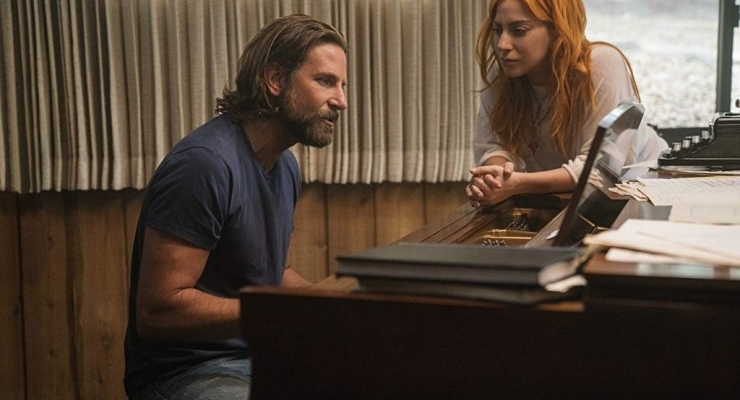 In line with all of its predecessors, this new entry in the Star is Born sweepstakes tracks the opposite career trajectories of its two principals: Ally’s star ascends while Jack, beleaguered by tinnitus, drinks himself into a downward spiral. Lady Gaga may be a pop music icon, but A Star is Born is her feature-length film debut in a leading role. This is also Bradley Cooper’s debut as co-writer, director, and, yes, singer and guitarist. As a further plus for this well-conceived, directed, and shot film, the chemistry between Gaga and Cooper really takes off and their love scenes percolate at the proper temperature. Having seen the most “recent,” i.e., 40-plus year-old Streisand-Kristofferson remake, this latest makeover gets most of the pieces of the puzzle absolutely right and, with its scrupulous updating, is a better film in all respects. The smaller roles taken by Elliot, Chappelle, Gavron, and Andrew Dice Clay (Ally’s father Lorenzo) provide excellent support of the film’s two strong leads. But this show really belongs to Lady Gaga whose powerful vocal performances are complemented by her genuine feel for a role smacking of her own journey to stardom in the highly competitive world of popular music. Matthew Libatique contributes terrific cinematography, frequently placing us right on stage during the numerous rock concert scenes. My one quibble with an otherwise fine effort is that its final act, beginning with Jack’s collapse on stage during the Grammy awards ceremony and his subsequent stint in rehab, makes the film play longer than necessary, a criticism also rightfully leveled at its predecessor that played even longer. That aside, this is one heckuva watch and I would be stunned if it did not get serious Oscar consideration for 2019. Highly recommended. A terrific remake of a Hollywood romantic staple with strong leads, direction, musical performances, and terrific playlist that is a substantial improvement over its immediate predecessor.